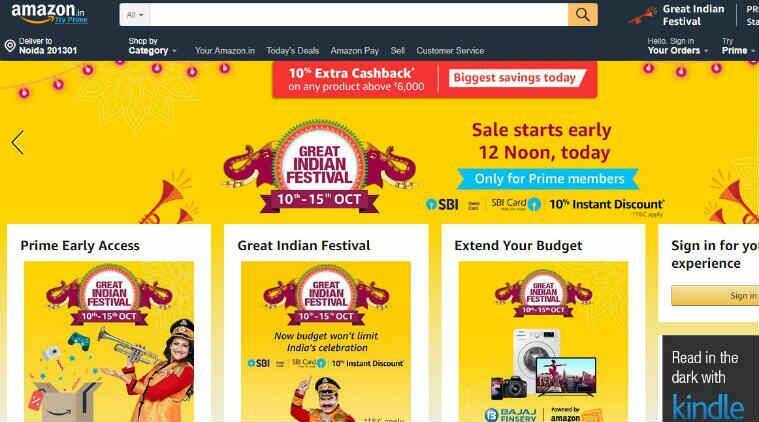 Amazon Great Indian Festival sale: For those shoppers holding Amazon Prime accounts, the sale has begun from 12pm on October 9, that is today. 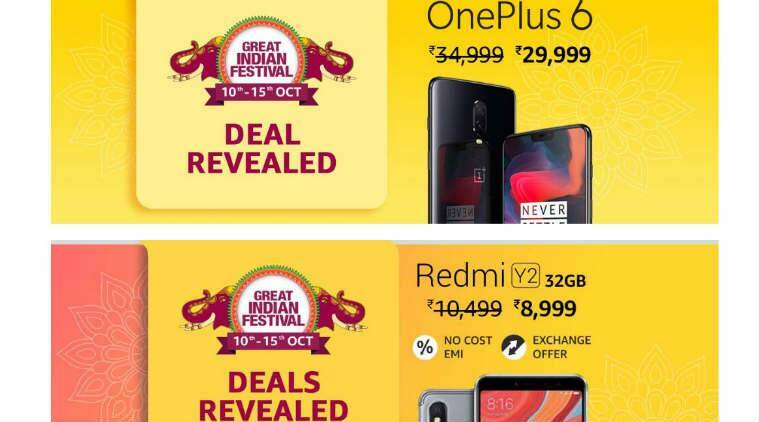 Amazon Great Indian Festival sale: Amazon’s festive season sale will take place between 12 midnight on October 10, and 11.59 pm on October 15. For those shoppers holding Amazon Prime accounts, the sale has begun from 12 pm on October 9, that is today. Amazon India has introduced a slew of offers for first-time shoppers, as well as for Prime customers. Across product ranges, Amazon will offer discounts and cashback for SBI card holders, while consumers can also choose to avail benefits through vouchers, Amazon Pay payments, or EMI offers. Amazon India will offer discounts over its product range, that includes Kindle, Amazon Echo as well as Amazon Fire TV Stick. As part of its sale, Amazon India will offer discounts over its product range, that includes Kindle, Amazon Echo as well as Amazon Fire TV Stick. Offers will be available to regular Amazon shoppers, as well as those with Prime memberships. As part of the Prime Early Access sale, Amazon is offering Fire TV Stick at a 30 per cent discount. 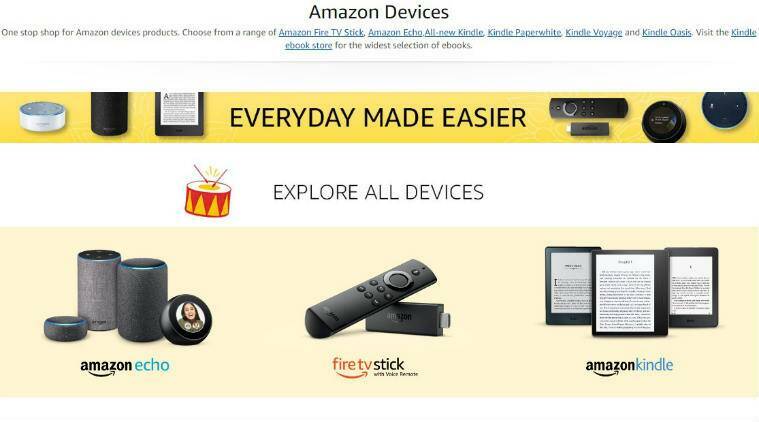 This means that Fire TV Stick will be worth Rs 2,799, down from its Rs 3,999 pricing. Also, Amazon Kindle Paperwhite will retail for an offer price of Rs 8,249, following a 25 per cent discount. Kindle owners can also consider the Kindle Unlimited pack, which will be made available at Rs 1,388. Amazon Echo Plus, available for Rs 11,999, or consider the Amazon Echo at Rs 6,999. In addition, users could bundle Echo devices with smart home devices, to receive discounts up to Rs 4,000, while discounts up to Rs 1,000 will be up for grabs on the Fire TV Stick, and Amazon Kindle devices can be bought for discounts of up to Rs 3,000. During the sale, Kindle eBooks would be made available from Rs 19, while annual Kindle Unlimited subscriptions worth Rs 1,499 can also be purchased. Through the sale, Amazon will offer exchange offers, cashback, screen protection as well as No Cost EMI deals across smartphones. The Great Indian Festival sale benefits extend to flagship smartphones, as well as top mid-range devices. Xiaomi phones that are part of Amazon’s Great Indian Festival sale for No Cost EMI, free screen replacement offers as well as Assured Buyback offers. The phones on sale include Redmi Y2, priced at Rs 8,999 (3GB RAM/32GB storage) and Rs 10,999 (4GB RAM/64GB storage), Redmi 6A worth Rs 5,999, that will be on flash sale every 2 hours from 8am on October 10, and Redmi 6 Pro, that is worth Rs 10,999. The Great India Festival sale benefits extend to flagship smartphones, as well as top mid-range devices. Amazon Great Indian Festival sale is also offering special benefits for flagship phones. For example, OnePlus 6 will receive a Rs 5,000 discount on its 6GB RAM/64GB internal storage and 8GB RAM/128GB internal storage options. The phones will be priced at Rs 29,999 and Rs 34,999 respectively, while No Cost EMIs are available for both OnePlus variants. Samsung Galaxy S9 will be available at Rs 42,990 (64GB variant) and Rs 44,990 (128GB variant), down from Rs 64,900 and Rs 68,900 respectively. Users can also get exchange benefits worth Rs 3000, and No Cost EMI offers beginning at Rs 4,777 per month. Meanwhile, the Huawei Nova 3i 4GB RAM variant will be available at Rs 17,990, down from Rs 20,990. Amazon Prime members can also avail Rs 1,000 cashback for this phone. Also, Honor Play 4GB RAM option will retail at Rs 18,999, and shoppers could purchase its 6GB RAM variant for Rs 23,999. For both variants, Amazon Prime users will receive extra cashback of Rs 1,000, that will be credited as Amazon Pay balance. In addition, Oppo Realme 1 6GB RAM variant will be priced at Rs 10,490 during the sale, down from Rs 14,990.